I began this post intending to share a little recipe about how to make Cashew Cream and I ended up writing a whole chapter about the past week. First, I wrote a little about how the pain process has been post my oral surgery. Second, I listed all the foods I’ve been consuming on the “soft foods” diet and how I’m getting my protein even though I’m supposed to avoid meat. If you’ve come across this post because you’re looking to read about other’s experiences with wisdom teeth extraction, you’ve come to the right place. It’s not exhaustive, but it’s a real slice. Enjoy! I had my wisdom teeth out one week ago. And I’m still in pain. It’s amazing how many people love to share their stories of how long they were in pain or how long they weren’t. I honestly love to hear them because, true to human nature, I like to compare my experience with theirs. Or contrast, as the case may be. It seems, however, that I am falling squarely in the middle of average. The square middle. Today, one week after my wisdom teeth extraction, my teeth still ache and talking for extended periods of time still makes me sore. But my worst day of pain was Thursday (6 days after surgery) when I was in tears and finally took a Vicodin. Up until Wednesday (two days ago), the pain was even on both sides, top and bottom. Very achy, swollen on the inside and stiff. On Thursday morning, I woke up with a very sharp, rather different and distinct pain on the right bottom side. The rest of my mouth felt fine. I woke up around 5 AM with this pain. In tears. Ryan woke up around 6 AM and talked me through it. He said I shouldn’t be afraid of the Vicodin, so I gave in and took it. I’d taken an ibuprofen an hour earlier with a glass of milk and was concerned that I couldn’t take ibuprofen with Vicodin but a thorough google search relieved my concerns. I had a small bowl of yogurt and took the Vicodin. About twenty minutes later, felt a wave of relaxation sweep through my body. Twenty minutes after that, the pain was gone. I slept for another hour before I had to get up and have Ryan drive me to my follow-up appointment where the oral surgeon told me that I was progressing normally. Yay! Today, I considered taking a Vicodin towards the end of the day but muscled through the pain and am about to take some ibuprofen PM and get some sleep. However, today is truly the least painful day thus far. Also, today I feel like I have most of my strength back. Recovering from surgery, even oral surgery, is no small thing. But what am I eating ?! While you’re recovering from oral surgery, you’re supposed to avoid meats and eat soft foods, both because it’s painful to chew and because if you chew with your molars, you’re likely to get food stuck in your wisdom tooth cavities. So how am I getting my protein while eating soft foods? Read on. Rice Meal (baby food): I mix it with hot milk (boiled on the stove), cocoa, stevia and a little almond meal (for protein). It’s actually quite yummy. Champagne Grapes: I’d happened to pick up a punt of champagne grapes two days before my surgery. I’m so happy I did! These tiny grapes were easy to smash with my tongue and swallow without chewing. They were tasty and refreshing. Raspberries: like the champagne grapes, the raspberries were also easy to mash with my tongue and swallow. Both are good choices for post-surgery health. Yogurt (for protein): mixed with stevia for a little sweetening. Mashed Carrots: steamed on the stove and them mashed in the food processor. I added a little honey for flavour. Soups: bean soup (for protein), tomato soup, red pepper soup, chicken broth with onions (although I don’t recommend that because I got onion stuck in a wisdom tooth cavity for thirty minutes), butternut squash soups. I’ve been sticking to the soups that are creamy and not chunky. Eggs: for breakfast. I just put one egg in a bowl and stick it in the microwave for 75 seconds. It’s easy to chew and not get stuck in your teeth and great source of protein. Mango Juice: it’s a treat to drink this. It’s full of fruit sugars and carbs, but I tell myself that because it’s fruit, it’s good for me. Green Fruit Juice (like Odwalla Superfood): with fewer carbs and fewer sugars than the mango juice, this helps me get the veggies that I can’t eat, such as broccoli. 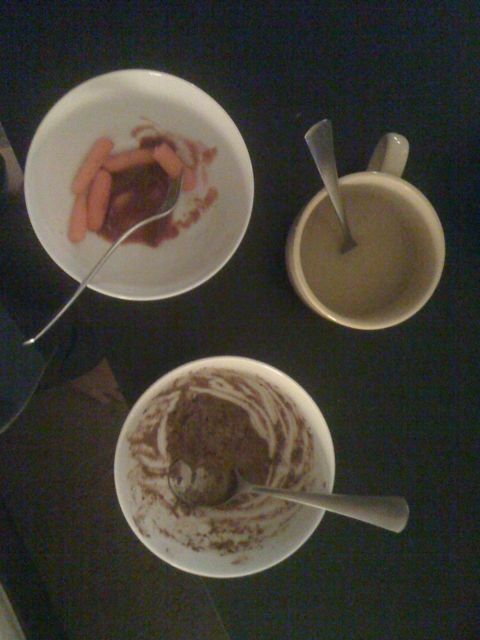 Pictured here are some steamed carrots (with ketchup for my Newfie heritage), chicken broth with boiled onions, and my cocoa rice meal. Pudding: chocolate (for protein, at least that’s what I tell myself). Frozen Yogurt: plain (for protein, wink wink nudge nudge). Before I had my teeth out I was eating an average of 60 grams of protein and 120 gram so carbs plus fat for a total of 1250 calories. During this soft food week, I’ve been averaging only 32 grams of protein and 150 grams of carb plus fat for a total of 995 calories. So my protein is down and my carbs are up! Not the best if I’m trying to keep healthy! So how to get more protein? Just today I discovered two more soft foods! The smoked salmon is an old favourite of mine (it’s all I ate during the summer of 2003) but because it’s expensive I’ve been avoiding it. I picked some up today to make a quiche for some friends and tried a bit. Oh joy! It was soft and easy to chew with my front teeth! I had some for dinner later with some raw cheddar and black bean soup (creamy). Yummy dinner. Also, a while back I’d made Cashew Cream for a visiting vegan to have on his strawberries. I was serving sweetened yogurt for the rest of us. Well I liked the cashew cream so much I ate it too! It’s such a simple recipe and very easy to make. And just today, I remembered it and thought that it’d be a great way to get more protein into my diet while avoiding most meats! I didn’t have cashews around, but I did have almonds. So I made Almond Cream. I followed the recipe found here. You have to use twice as much water when you use almonds, but it’s a lovely flavour. I think I’ll be adding it to my yogurt as well. But what a tasty way to add more protein to my soft food diet! Here’s the Almond Cream pictured in a reused Trader Joe’s Black Bean Dip jar. So there you have it, my experiences with dealing with the pain and how I’m still getting proper protein while avoiding most meats. While my post-oral surgery experience, has been quite middle of the road, I hope yours (if it’s still to come) is on the painless side of average. P.S. Most of the foods mentioned are certified organic and non-GMO where possible. That’s really strange about your sister!! How weird!